A wonderful production of the Massenet opera inspired by Goethe’s early hit The Sorrows of the Young Werther (1774) about disappointed love. Poor Werther – can’t manage to get his mind off Charlotte, even after she’s married Albert, a much less interesting guy. Alas, Charlotte seems too to have loved Werther, but being a very good girl, she holds to the word she gave her mother on her death-bed that she’d marry Albert. 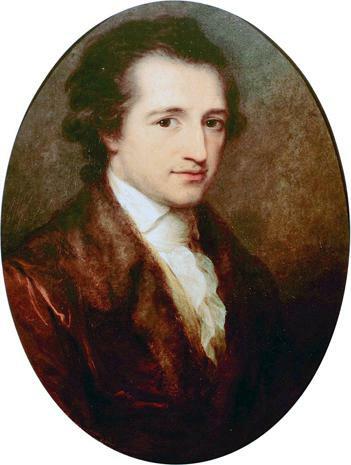 Albert is actually a very nice and decent guy, and he and Charlotte could probably have lived a rather pleasantly boring existence if young Werther hadn’t turned out to be such a ball of fire. Werther simply won’t let go of Charlotte. There’s even the purely delightful Sophie, Charlotte’s sister, hanging around and ready to get involved, but Werther will have none of it. I suppose it was all for the best, otherwise, there wouldn’t have been a great tragedy to write an opera seria about. Apparently, Jules Massenet read Goethe’s novel a century after it was written but was so taken by it that he decided to write an opera based upon it. It’s actually quite a good opera. The music is nuanced and interesting, the plot is not too involved but complex enough to keep one’s attention, and it maintains a passionate thread throughout. The evolutionary development of the music is striking. It starts out, strangely enough, sounding like some Frenchified version of Wagner with a lot of atmospheric waves of tonality pouring over one another. It’s not bad, but it has a derivative flavor. 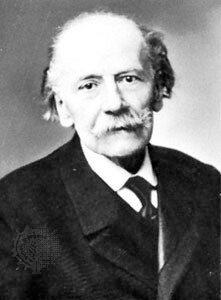 But, as the opera develops, Massenet’s distinctive voice emerges. That voice, to put it somewhat crudely, sounds a bit like Puccini without the arias, but it’s still very good. There’s a lot of interesting instrumentation, and the weaving together of the orchestral score with the vocal parts is very well done. Notably, there are great passages where a solo violin or cello reaches out of the pit, singing along almost as another voice. And the curiosities of the winds, including the horn, are everywhere apparent. Instrumentation is also kind of cool. There’s one spot where an organ appears; one of the characters even calls attention to it in the libretto. There are other spots, near the end, where I swear I heard saxophones. It’s possible it was some other kind of reed, but the airy sound is quite different from what one ordinarily gets. This excellent production is striking in several ways. The design is, in one sense, quite simple, but also highly effective. With a trio of screens thrown up in the background, the set becomes a template for a quite varied array of interesting projections. They’re really well done, and keep changing . During the intense I love you so much moments, there are great scenes of the lovers mooning at one another from different angles, but done with enough art and soft focus to make them effective and not annoying. At other points, intense abstract designs populate the screens. It reminded quite a bit of the artistry that went into the projections in Robert LePage production at the Met of Wagner’s Ring a few years back. These were not a elaborate as those – I’m sure they also cost about one thousand times less – but they were extremely effective. 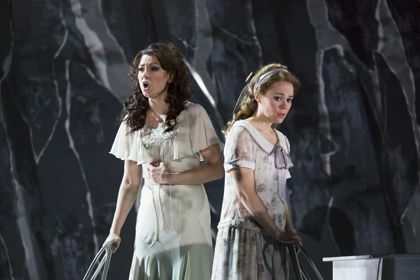 I’ve been continually struck by how much the Boston Lyric Opera makes out of relatively little in terms of stage craft and how effective it generally is. In this case, it’s strikingly effective. There are also chairs glued up on the screens and thrown around the stage, symbolic probably of something about stability and individuality. Whatever it signified, it added a nice modern touch and worked quite well. Singing throughout was really top-notch. Sandra Piques Eddy as Charlotte has a rich contralto that oozes out like butter and works incredibly well with Alex Richardson’s appealingly smooth, smoky tenor. 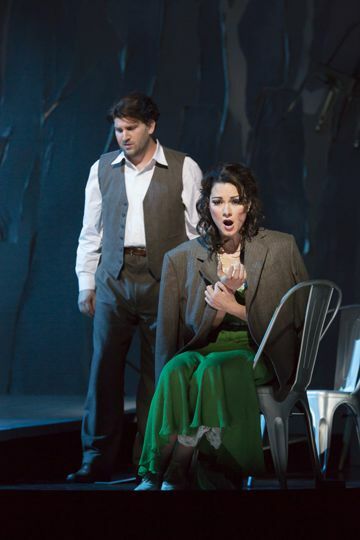 Rachele Gilmore as Sophie is also strikingly good, and as Albert, John Hancock provides a solid resonant baritone. The children’s chorus weighs in mostly at the beginning and at the end but they do an incredibly fine job. Their part is not tra-la-la simple by any means – it has some considerable musical heft to it – and they carry it off beautifully. The orchestra under David Angus is really amazing. This is not a full-time opera orchestra but they really do a wonderful job. The soloists – Annie Rabbat on the violin and Loewi Lin on the cello, and the wind section – are particularly notable, but the entire orchestra plays with precision and expression. Frankly, I was surprised by how much I truly enjoyed this production. It’s not that I don’t like Massenet, but I underestimated the compositional ingenuity of the score and its effectiveness in creating the tensions and the moods that the opera demands. And the production kind of blew me out of the water with the consistency of its musical quality and expertise, as well as with the ingenuity and artistry of its design.